← Un referendum sul Governo? Mr Renzi’s speech on the night of the referendum clearly summarised how he approached the referendum campaign. In the entire speech, he never mentioned his own party, the Democratic Party (PD), while he focused entirely on his own responsibilities. Referring to those who campaigned for a Yes vote, he commented that “you campaigners have not lost, but I have lost”. The personalisation of the vote has been the distinctive feature of the campaign for Italy’s constitutional reform. From the very beginning, Mr Renzi has linked the fate of his government to the approval of the reform, promising to resign should the proposal be rejected. A promise that he promptly fulfilled, after almost 60% of Italians voted against the reform. Italian voters seemed to have followed Renzi’s personalisation strategy. Instead of a referendum on the Constitution, the consultation became a clear consultation on the Government, and especially on the Prime Minister. Data in Figure 1 confirm that Yes votes in the referendum are clearly correlated with support for the Democratic Party in the 2014 European election – the only nation-wide election in which Renzi was Prime Minister. The correlation is neat: the higher the support for the Democratic Party, the higher the support for the reform. The map shows also a clear regional divide. 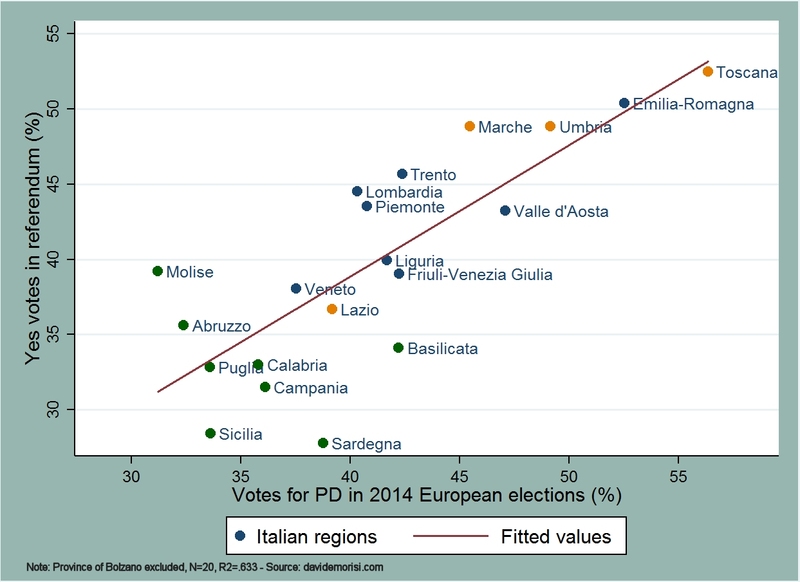 In Southern regions (the green dots), where support for PD is lower, Italians voted largely against the reform. The share of Yes votes increased in Northern regions (the blue dots), reaching the highest share in the so-called “red regions”, i.e. the regions in which the left-wing has historically enjoyed high consensus. These regions include three regions from Central Italy (the orange dots, including Renzi’s region of Tuscany), in addition to Emilia-Romagna. 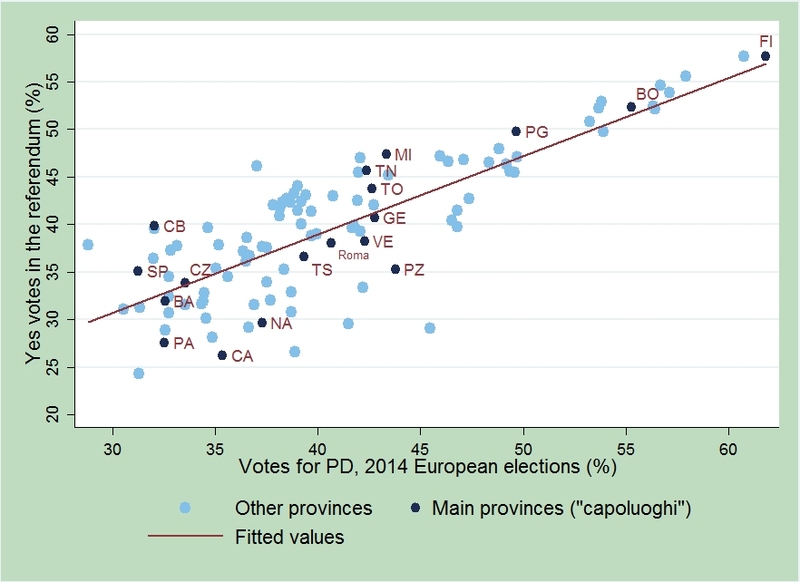 Figure 2 shows a very similar correlation at the province level: the higher the support for PD at the province level in the 2014 European elections, the higher the share of Yes votes in the referendum. By personalising the referendum campaign, Mr. Renzi gambled all on PD’s high electoral support and high approval ratings for his government. However, support for PD by itself might not be enough to win a referendum. As our recent analysis shows, personalising the vote in a high-stake referendum proves a risky strategy. This strategy might work when government’s popularity is high, but when approval ratings go down it can backfire. This entry was posted in -(meta) English, Italian referendum, Referendums. Bookmark the permalink.